It cleans so silently that it can be used even in the most noise sensitive areas. 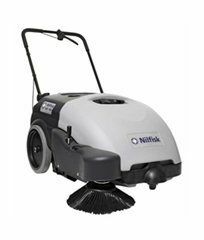 At just 59dbA, the SW750 sweeper is suitable for daytime cleaning without risk of causing disturbance. In fact, the entire design is so efficient, and so cleverly thought-out, that productivity is assured even with an inexperienced operator, while operating costs are minimized.